Butter a casserole dish or loaf pan (approximately 9-inches x 5-inches). Slice each croissant across its width into three even sized pieces. Place the croissants in the casserole dish. Slice the vanilla pod open and scrape out the vanilla beans into a small saucepan. MIx in the milk, golden caster sugar, and salt, and simmer over low heat until just under boiling, stirring constantly. Remove from heat. Remove and discard the vanilla bean. In a medium bowl, beat the eggs together with the buttermilk. Very slowly, pour the hot milk mixture into the egg mixture, while stirring constantly. Make sure you do this slowly, so the egg mixture does not get cooked by the milk mixture. Pour the mixture over the croissants. Gently push the croissant pieces around until they are all soaked in the mixture. If you have time, you can leave it to sit for 30 minutes. If using the dark chocolate chips, sprinkle on the dark chocolate chips and lightly give the croissant pieces a stir, it so some of the chocolate chips get tucked between the croissants pieces. Sprinkle on the demerara sugar. Bake in the oven for 30 minutes, until the top of the croissant bread pudding is lightly browned. In a small bowl, combine the almond butter, coconut oil and maple syrup together. Slowly pour half of the almond butter drizzle over the croissant bread pudding while it is in the pan. Save the remaining almond butter drizzle to top on each individual slice of croissant bread pudding as served. Serve immediately while warm. 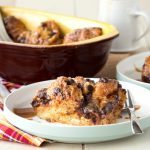 Get this recipe for Croissant Bread Pudding with Almond Butter Drizzle at https://www.theworktop.com/breakfast-brunch-recipes/croissant-bread-pudding-almond-butter-drizzle/.